EghtesadOnline: President Donald Trump pardoned former Arizona county sheriff Joe Arpaio on Friday, using his first act of presidential clemency to give reprieve to a political supporter known -- and criminally convicted -- for his tough crackdown on illegal immigration. "Sheriff Joe Arpaio is now eighty-five years old, and after more than fifty years of admirable service to our Nation, he is worthy candidate for a Presidential pardon," the White House said in a statement. Trump lauded Arpaio for his "life’s work of protecting the public from the scourges of crime and illegal immigration." Arpaio, one of Trump’s earliest supporters, was convicted of federal misdemeanor criminal contempt this year after a judge found he had defied a court order to stop targeting suspected undocumented immigrants. By pardoning Arpaio, Trump threatened to further inflame national tensions over race and immigration while also alienating some of the Republicans who have touted the importance of the rule of law, according to Bloomberg. Arpaio, who served for 24 years as the sheriff of Maricopa County, Arizona, was defeated in last year’s election. "I have to thank the president of the United States," Arpaio said in a telephone interview. "I feel vindicated." House Speaker Paul Ryan, a fellow Republican, was among those taking issue with Trump’s decision. Trump didn’t vet the pardon through the Justice Department, according to an official with knowledge of the decision who asked not to be identified. That circumvented the traditional political process for issuing pardons. The website of the department’s pardon attorney states, “All requests for executive clemency for federal offenses are directed to the Pardon Attorney for investigation and review.” Justice Department guidelines say pardon requests shouldn’t be made until five years have passed between a conviction or completion of a sentence. However, the president can grant a pardon “to any individual he deems fit, irrespective of whether an application has been filed with the Office of the Pardon Attorney,’’ and at any time after the commission of an offense, according to the Congressional Research Service. Arpaio was convicted in July and has yet to be sentenced. He would have faced a maximum of six months in jail, though his age and lack of previous convictions may have led to a more lenient sentence. Despite Trump’s praise, critics have said Arpaio’s persecution of illegal immigration promoted racial profiling. Arpaio also pushed the baseless conspiracy theory that former President Barack Obama wasn’t born in the U.S.
Arizona’s other Republican Senator, Jeff Flake, was more muted. "I would have preferred that the President honor the judicial process and let it take its course," Flake, often a Trump critic, said on Twitter. Kelli Ward, who’s seeking to oust Flake in 2018, praised the pardon. "We applaud the President for exercising his pardon authority to counter the assault on Sheriff Arpaio’s heroic efforts to enforce the nation’s immigration laws," Ward said in a statement. Yet the president’s move drew heated responses from many others, including the Council on American-Islamic Relations, which called the pardon "unconscionable," saying it "once again sends the troubling message that Mr. Trump sees himself not as president of the United States, but as the leader of a resurgent racist movement within our nation." The American Civil Liberties Union said the president "has chosen lawlessness over justice, division over unity, hurt over healing. 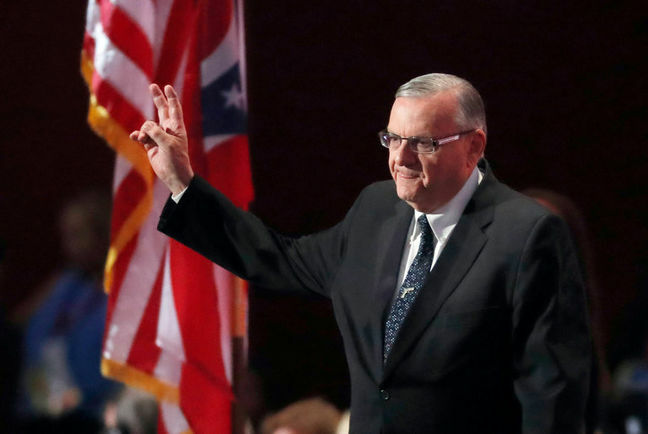 His pardon of Arpaio is a presidential endorsement of racism." It’s rare for a president to issue a pardon so early in his term. Obama pardoned 212 individuals during his eight-year term, with the majority of those in his final weeks in office, according to the Justice Department. Most recent presidents have opted against pardoning elected officials. The last president to issue a pardon the same year he was inaugurated was George H.W. Bush in 1989.